The Borderlands 2 video games favorite general purpose robot is ready to play Yahtzee! 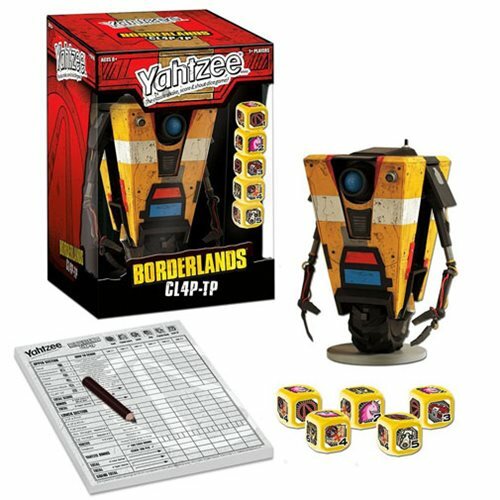 So, show your enthusiasm and start rolling with Yahtzee Borderlands CL4P-TP. Play the classic game of Yahtzee with your very own custom CL4P-TP dice shaker cup and roll with Borderlands dice. Highly collectible and a perfect gift for Borderlands fans! Comes with Collectible CL4P-TP Dice Shaker Cup; Custom dice featuring Borderlands Achievement icons including Vault, Pandoracon, Chest, Map, Psycho Mask, and CL4P-TP; Custom Score pad; Pencil; and Instructions. For 1 or more players ages 17 and up.